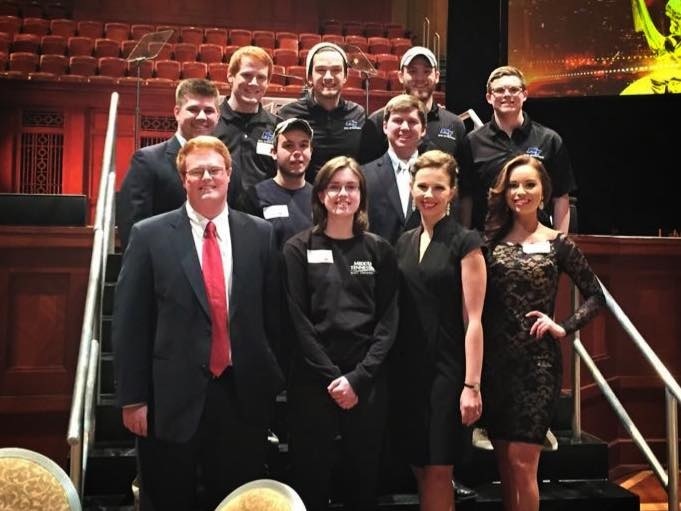 Current MT10 production staff who worked with TNDV and other MTTV/MT10 alumni to broadcast the 29th annual Midsouth Regional Emmys. Bottom row: Chris Davis, Multimedia Journalism student, former MT10 news director and current NewsChannel5 associate producer; Melody Carson, Video & Film Production student and MT10 general manager; Bethany Thompson, Multimedia Journalism student and current MT10 news director; Brooke Grimsley, Multimedia Journalism student and Talent-EMC Productions. Middle row: Grant Massey, New Media student and current MT10 News social media director; Justin Carroll, Video & Film Production student, camera for EMC Productions and MTSU Film Guild officer; Brett Gilbert, MMJ student and current MT10 News assistant news director; Zac Leonard, Video & Film Production student and MT10 News chief photographer. Top row: Chris Robertson, Video & Film Production student and MT10 News production director; Murphy Mulvihill, Video & Film Production student and replay operator for EMC Productions; Phil Layton, Video & Film Production student and camera for EMC Productions. 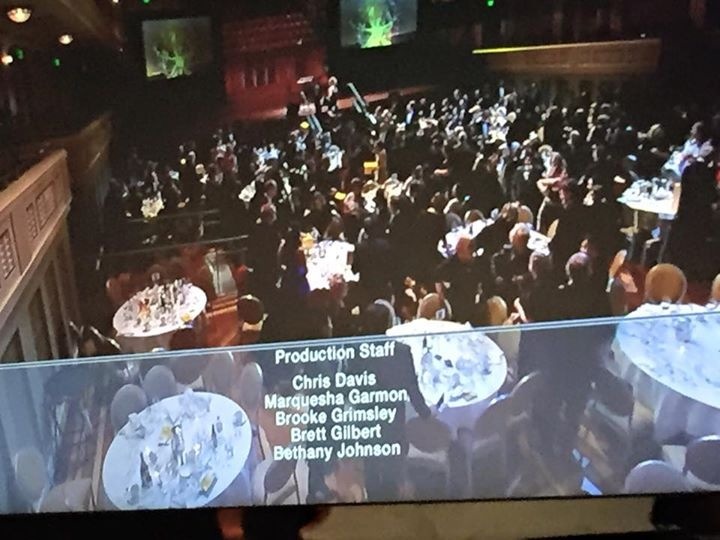 MTSU Mass Communication students and alumni were well represented on both sides of the camera during the Nashville/Midsouth Chapter of The National Academy of Television Arts and Sciences (NATAS) Midsouth Regional Emmy® Awards on Jan. 31 at the Schermerhorn Symphony Center. The television remote facilities were provided in high definition by the major telecast sponsor, Tennessee Digital Video (TNDV). 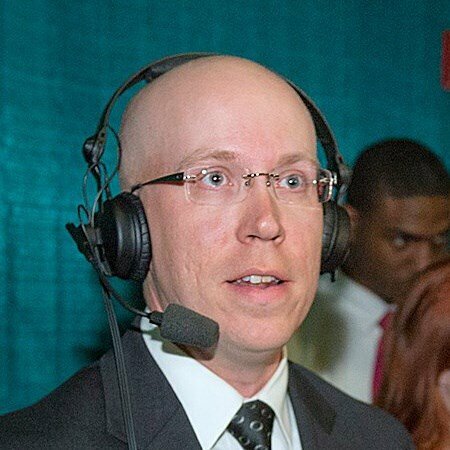 TNDV is owned and operated by Mass Comm alumnus Nic Dugger (’05), who is also the vice president of NATAS Nashville. Dugger presented the Governor’s Award in addition to winning two more Emmys in the Entertainment and Technical Achievement categories for his work on the program Bluegrass Underground. Dugger wasn’t the only MTSU alum to win big at the ceremony. MTSU Mass Communication graduate Matthew Parker (’13) won an Emmy in the Breaking News category for his work on a small plane accident entitled Deadly Plane Crash. Parker, a producer for WSMV-TV Channel 4, accepted the Emmy while thanking his Channel 4 team. It was a meaningful win those Mass Comm students volunteering as production staff for the evening. Parker had been a valued member of the MT10 team, MTSU’s student-run television station, during his tenure at the college. Several peers of Parker’s were working behind the scenes as he accepted his award. Chris Davis, former MT10 news director and friend of the Emmy winner, spoke highly of Parker and his win. MT10 gives students opportunities to work on camera, behind the scenes and in managerial positions doing both daily news and original programming shot in a state-of-the-art green screen robotic studio. Experiences at MT10 have led alumni to careers as Emmy-winning news reporters, editors, producers, production personnel and entrepreneurs. MT10 is available locally on Rutherford Country Comcast Channel 10 and online at http://www.mt10tv.com.